Once upon a time there were three little Dassie sisters --Mimbi, Pimbi, and Timbi. Just like the little pigs who built new homes, the sisters cross a desert in southern Africa to build their houses. "Welcome!" Says a smiling Agama Man. He is happy to see them, for he is the only one there, he tells them, except for an eagle. The Dassies shiver, but they stay. The very next day the eagle dives down to flap and clap and blow in Mimbi's grass house and carry her up to his nest. Back he goes for Pimbi. Then for Timbi. But Timbi outsmarts that pesky eagle as Agama Man attempts a daring rescue of Mimbi and Pimbi. Bold African patterns and prints fill Jan's stunning borders where that handsomely dressed man looks on. 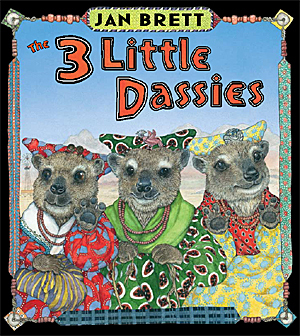 But it is the Dassies, in their bright colorful dresses and hats, that steal the show in this irresistible tale. My African version of the three little pigs' story began in 2007 when my husband Joe and I camped in Namibia in southern Africa. "One morning we climbed up and sat by a freshwater spring. Sunny on the reddish rocks were little rock Dassies, the cutest and most unusual creatures you can imagine with a big bump of a nose like a koala bear, bright eyes and soft fur. A redheaded Agama lizard came along and acted as if he owned the place. Then the shrill whistle of eagles overhead sent the Dassies running for cover. Eagles have a strong appetite for Dassies. "I went home with images of Dassies, the Agama lizard and eagles dancing in my head until they became my characters, with the three little Dassies in dresses and flat turbans like the ones worn by the Herero women since Victorian times. Joe and I agreed that our trip had turned into a treasure hunt."